Ever plan a big party? How many people were there? One hundred? Five hundred? Now just think of what it'd be like to do that for 20,000! But that's exactly what French President Émile Loubet pulled off on September 22nd, 1900. Loubet, a former mayor himself, wanted to diminish the power of the Parisian city government. And he could think of no better way to do that than to invite all of France's mayors to an incredible party -- in Paris! The menu consisted of fifteen hundred pheasants, twenty-five hundred ducks, twenty-five hundred chickens, five thousand pounds of beef, six thousand pounds of salmon, thirty-three thousand bottles of wine and seven thousand bottles of champagne. 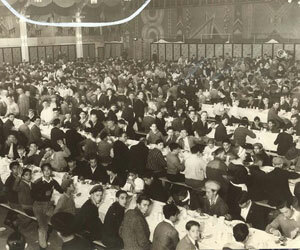 It required twelve temporary kitchens to be set up and manned by three thousand waiters who covered a square mile of party space. I can only imagine what happens when political activism combines with extreme drunkenness, but the party actually went off without a hitch.